Applesauce: Brawl to the Finish! When I was a kid we had several apple trees out back. The apples were good for throwing at siblings, feeding broken pieces (run over by the lawn mower) to hogs, and making applesauce. One afternoon my friend Joy and I were left unattended and we made enough applesauce to feed a hungry platoon. I got about three pounds of apples over the last couple of weeks from my CSA so this morning I woke up thinking about applesauce. I hit Allrecipes and came up with two recipes I wanted to try, so I decided on a head-to-head competition between the two recipes. 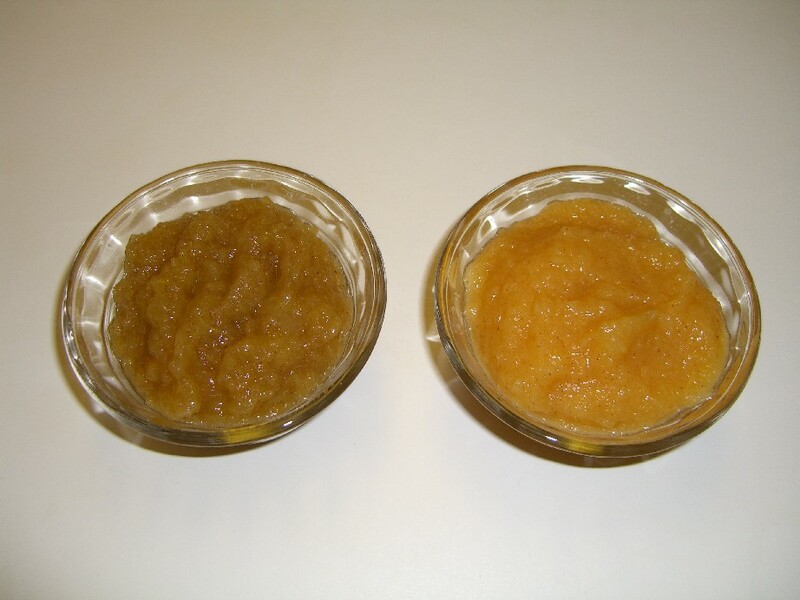 Applesauce A included ground cloves, which was the only ingredient different between the two. 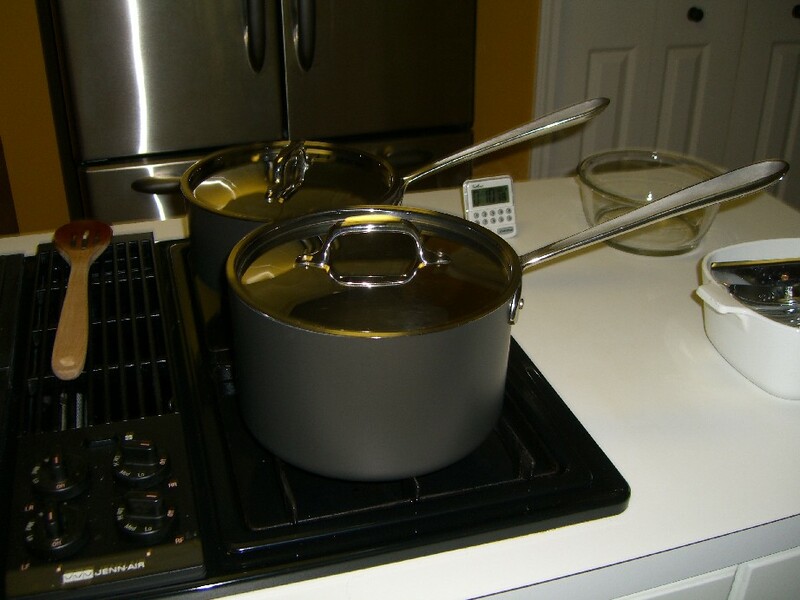 Amounts of apple, water, cinnamon and sugar and cooking times were different. I have the same complaint about both recipes. They both use very subjective amounts of apples. 6 cups and 4 apples. Depending on the size of your chunks or the size of your apples, you could end up with a vast disparity in the total amount of fruit going into the sauce. I would have preferred apples by weight. Both Applesauce A and Applesauce B called for 3/4 cup of water even though the amount of apples going into it were different. I ended up reducing them both to 2/3 cup and still ended up with excess water. My apples were sweet so I cut the amount of sugar down on both recipes as well. Applesauce A on the left, B on the right. Applesauce A with its cloves tasted and smelled like Christmas. Mmmm. Using the potato ricer on it and then adding some crushed pieces made a nice, slightly chunky consistency. I would use this if I was going to make an applesauce cake or something, or just eat straight up. Which I did. Applesauce B was very well spiced and sugared. Putting it in the food processor to pulverize it gave it a nice, smooth texture. I’d eat this straight, on pancakes, on English muffins, on toast, or anything else I could think of. Finally, an objective taste test: Test Subject Bill, after given an opportunity to sample both sauces and approving both, chose applesauce B for his lunch. Therefore I declare Applesauce B the winner by a very close margin.